Vince Carter takes a shortcut to work one day and notices a billboard advertising Dream Woods and its mascot Sebastian the bear. Dream Woods is New England’s version of Disney World. Vince wants to take his family to Dream Woods for vacation, but the park has been closed for nearly 20 years. Dream Woods was nicknamed Scream Woods because there were rumors of murder, sacrifice, and torture at the theme park. Vince is trying to repair his crumbling relationship with his wife, Audra, and he thinks Dream Woods will do the trick. Vince takes his wife and two boys, Tim and Andrew, to Dream Woods, but the fun and excitement are short lived. Vince and his family get trapped at the park. Dream Woods mascot, Sebastian the bear, and his army of gray skins chase after the Carter family. The buildup to the confrontation between the Carters and Dream Woods’ staff is masterful! I have to admit, I am a sucker for books about theme parks! I like a good theme/amusement park! Patrick Lacey makes you feel for the characters, especially Tim and Andrew. Dream Woods is a smooth read that unfolds nicely. Reading Patrick Lacey is like watching a movie, and yes, someone should adapt Dream Woods to the big screen. This book is a quick, satisfying read that you won’t be able to put down. 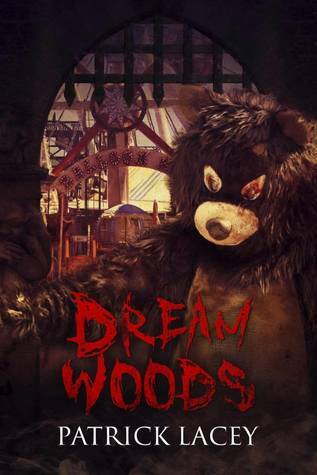 Enter Dream Woods if you dare, but beware of Sebastian the bear! I highly recommend this book to fans of horror and theme/amusement parks!